One of the first buildings in the USA to use FSC-certified cross-laminated timber (CLT) as its primary structure. Combining urban agriculture and sustainable land-management practice in an innovative curriculum, a new 14,000 square-foot addition to Common Ground High School synergistically integrates an array of sustainable design features to reduce its carbon impact on the landscape and the environment. 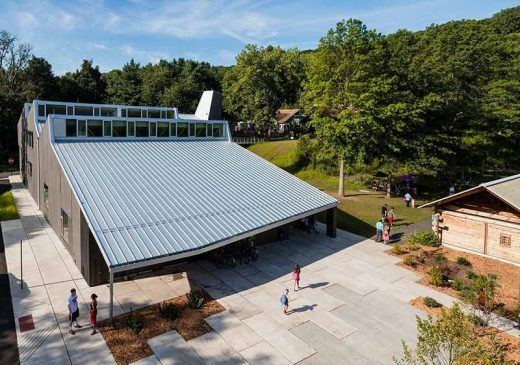 In order to ensure that its facilities embody the same environmentally sustainable ethos that has defined the school’s curriculum for twenty years, the project brief challenged the design team of Gray Organschi Architecture and lead engineer Chris Carbone of Bensonwood, along with Atelier 10 and Edward Stanley Engineers, to weave the new building into the fabric of farm buildings, agricultural fields, upland forests, and wetland habitat that serves as the school’s working landscape and outdoor classroom. A primary objective was a pedagogical one; that the building itself would be an environmental exemplar that integrated new ecological concepts and building technologies in a clearly legible and potentially instructive way for the New Haven area teenagers, children, and adults that participate in the school’s educational programming. In order to meet the high and well-informed expectations of Common Ground’s students and faculty, the design team developed innovative approaches to minimizing the building’s environmental impacts, improved the existing biological and hydrological processes of the site by using low-impact techniques and environmental best-practices, and developed solutions to minimize operational and embodied carbon. 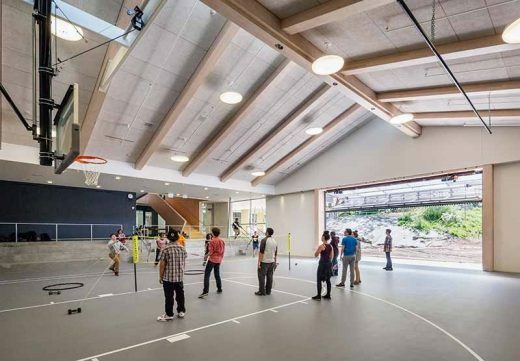 The building’s interior is heated and cooled by a synergistic system of 306 solar photovoltaic panels—capable of producing 76.5 kWh—and ground-source heat pumps served by 18 geothermal wells underneath the school’s parking area. Storm-water collected from across the entire campus is filtered through a series of rain gardens, bioremediation pools, and low-energy agricultural irrigation systems that dramatically reduce additional loading of the city’s antiquated storm sewers. Carefully articulated skylights optimize natural day-lighting that can entirely eliminate the need for artificial illumination, and strategic window placement avoids over-heating during the summer while allowing for passive solar heating during winter. In total, these systems can reduce the school’s annual energy costs by 60% and its water consumption by 30%. 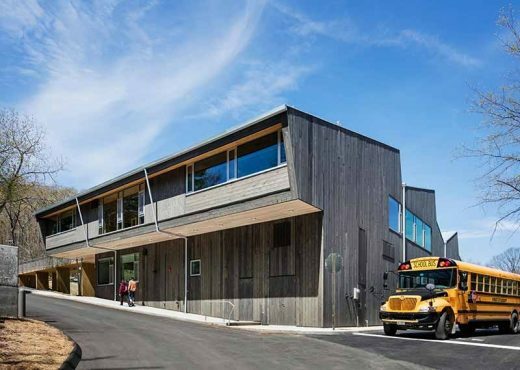 In addition to its integrated energy and water systems, the new building at Common Ground exploits the structural capacities and ecological benefits of wood fiber. It is one of the first buildings in the United States to use FSC-certified cross-laminated timber (CLT) as its primary structure. 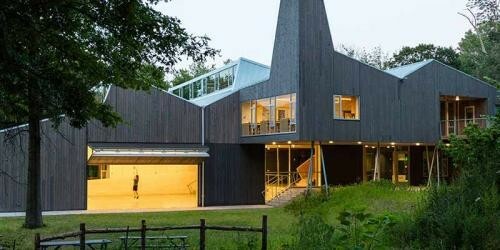 In order to maximize the beneficial environmental aspects of timber construction, the design team deployed cellulose-based building materials throughout the addition—from the primary structure and “stressed-skin” roof system to interior finishes and the insulation—and sourced all the mass timber materials from Nordic Wood Structures in Montreal. 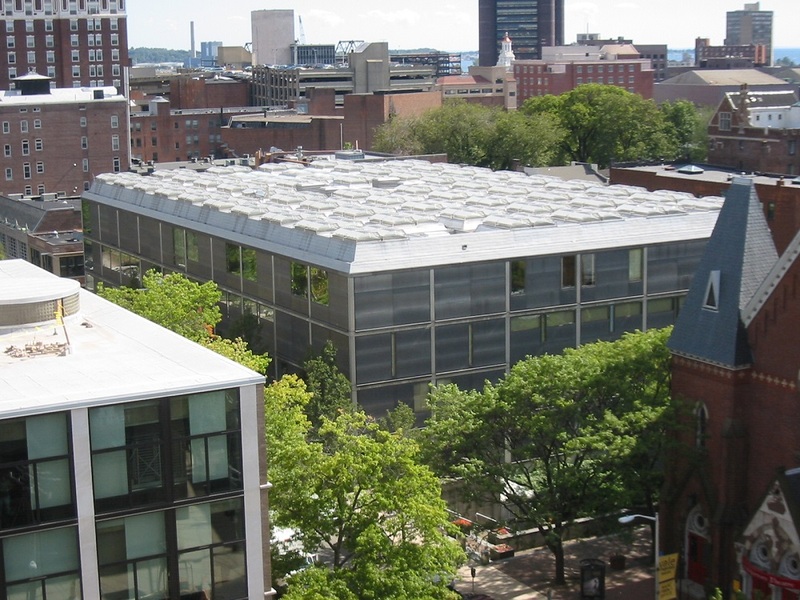 One notable benefit of this aggregation of construction biomass is that the carbon sequestered in the building’s structural system offsets the annual emissions of 107 cars, making the building carbon neutral in its first decade of operation. 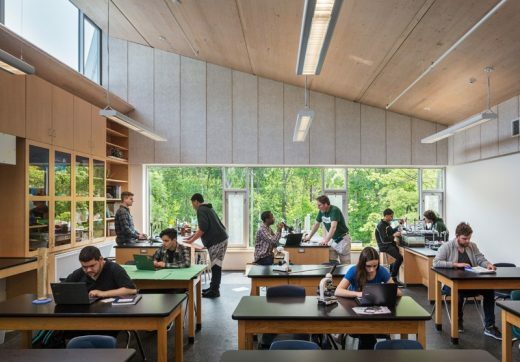 A flagship of environmental stewardship, responsible material deployment, and innovative timber assemblies, Common Ground High School will serve as a model for future institutional projects in Connecticut and throughout the United States.